Progressive die presses stamp metal using a forming method that can encompass bending, cutting, punching and several other ways of modifying coil sheet steel. The automatic feeding system pushes a strip of metal (as it unrolls from a coil) through all of the stations of a progressive stamping die. Each station performs one or more operations until a finished part is made. The final station is a cutoff operation, which separates the finished part from the carrying web. The carrying web, along with metal that is punched away in previous operations, is treated as scrap. The progressive stamping die is placed into a mechanical or servo stamping press. As the press cycles, the top die moves up with the platen, which allows the material to feed through the die. When the press platen moves down, the die closes and performs the stamping operation. With each stroke/cycle of the press, one or more completed parts are cut off and removed from the die. Progressive die presses come in many sizes from renowned press manufacturers such as Aida, Blow, Bruderer, Chin Fong, Danley, Komatsu, Minster, Schuler, Mueller Weingarten, Seyi, Stamtec, Sutherland, and Verson. 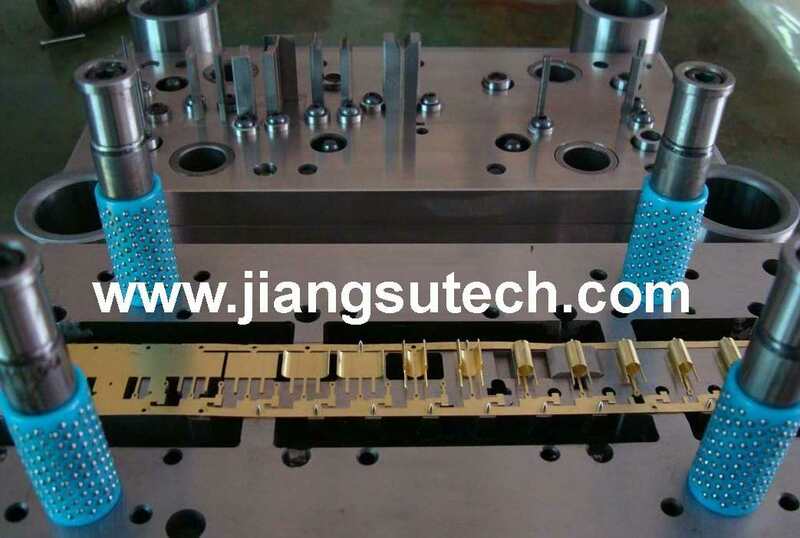 Jiangsu Tech offers progressive die stampings utilizing state of the art press technology to maximize efficiency. We match each stamping component with the ideal manufacturing technology to give our customers the highest quality stamping parts at the lowest cost.